VLF stands for Very Low Frequency. VLF is generally considered to be 0.1 Hz and lower. 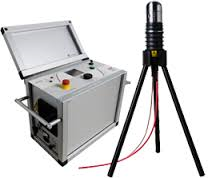 VLF testing is used for any application requiring AC testing of high capacitance loads. The major application is for testing solid dielectric cable, followed by testing large rotating machinery and occasionally for testing large insulators, arrestors, and the like. Even if a utility doesn’t adopt VLF for widespread cable testing, one of the best reasons to use VLF is to check installation quality and accessories, like splices. Many failures are due to damage during installation, improper workmanship, and/or insulation damage caused by excessive voltage fault locating - thumping. At the very least, every newly installed or repaired cable should be VLF tested before re-energizing. Tan Delta (TD) – also referred to as Dissipation Factor or sometime even Power Factor – is an excellent diagnostic test that provides an indication as to the quality of the dielectric insulation used in electrical apparatus. By analyzing the dielectric losses in the insulation, the TD Series of test instruments provide the testing engineer with a versatile high voltage diagnostic system that is suitable for testing MV cable such as XLPE, EPR, PE and PILC. In addition, other electrical apparatus such as capacitors, transformers and large rotating machines can also be diagnosed. Also check the rest our Hi-Voltage & Insulation Systems!